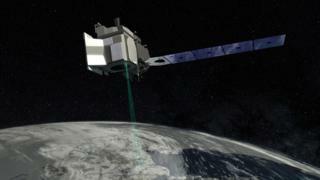 The American space agency is about to put a laser in orbit to measure the condition of Earth's ice cover. A Delta II rocket is booked to take the satellite laser into space on Saturday. Lift-off from the Vandenberg Air Force Base in California is scheduled for 05:46 local time (12:46 GMT; 13:46 BST). Nasa has since re-modelled the technology, both to make it more reliable and more efficient. "ICESat-2 is going to observe the cryosphere with a spatial resolution at the level we have never seen before from space," explained Prof Helen Fricker from the Scripps Institution of Oceanography. "The beam is split across-track into six - three pairs - so we can map more of the ice surface as well as estimating the surface slope, which can confuse our interpretation of height changes. "The orbit reaches to two degrees of the poles, and the same ground tracks are sampled every three months, giving us seasonal snapshots of ice height. From these data we can unravel the processes responsible for the ice loss in the polar regions," she told BBC News. Antarctica and Greenland lose billions of tonnes of ice every year - the result largely of warm water being able to melt land glaciers where they meet the ocean. This wastage is slowly but surely pushing up sea-levels worldwide. Much of the change that is occurring at the poles can present itself in quite subtle ways, says Dr Tom Neumann, Nasa's ICESat-2 deputy project scientist, and a very precise tool is needed to characterise it properly. "An elevation change of just a centimetre over an ice sheet the scale of Antarctica represents a tremendous amount of water either gained to or lost by the ice sheet. 140 gigatonnes worth." Weighing half a tonne, the new laser system is one of the largest Earth-observation instruments ever built by Nasa. It uses a technique called "photon counting". It fires about 10,000 pulses of light every second. Each of those shots goes down to the Earth and bounces back up on a timescale of about 3.3 milliseconds. The exact time equates to height of the reflecting surface. "We fire about a trillion photons (particles of light) in every shot. We get about one back," says Cathy Richardson, who works on the team at Nasa that developed the instrument. "We can time that one photon when it comes back just as accurately as when it left the instrument. And from that we can calculate a distance to about half a centimetre on the Earth." The proposed solution is to combine ICESat's laser observations, which reflect off the top of the snow surface, with those of radar satellites, whose microwave beams penetrate more deeply into the snow covering. This will reduce a lot of uncertainty. Scientists need thickness measurements to properly access the status of floes. Sometimes winds will spread the ice out; other times it will pile the ice up. The difference is only apparent when the ice is viewed in three dimensions. And, no, the laser does not have the power to melt the ice itself. But on a dark night you might just be able to see a green dot when ICESat flies overhead.